Enjoy non-stop action with nearly 2,000 new and exciting slots and 33 thrilling table games. 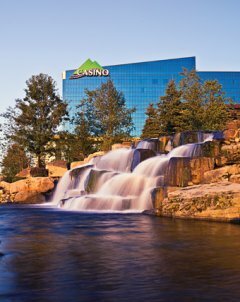 Indulge at a variety of delicious dining options including Thunder Mountain Buffet, Casino Player Magazine’s “Best of Gaming” winner and The Western Door, Western New York’s premier steakhouse. Join the Seneca Players Club and earn comp points when you play slots and table games. Experience world-class entertainment in our 2,400 seat events center. Seneca Allegany Resort & Casino is 68,000 square feet of world-class gaming, with nearly 2,000 reel-spinning and video slot machines and 33 of your favorite table games including Blackjack, Craps, Roulette, Caribbean Stud Poker, 3 Card Poker Let It Ride®, Texas Hold ’em Bonus Poker, Big 6 Wheel and Spanish 21. We proudly feature Turtle Island, our non-smoking casino, new high limit slot and table games areas and The River Bar. Come see why Seneca Allegany Resort & Casino is where the action is! The Western Door: A Seneca Steakhouse, our award-winning steakhouse. Enjoy the highest quality steaks and chops. The freshest fish and seafood flown in daily. The finest wines from the Finger Lakes region and around the world. The Western Door Steakhouse is an unforgettable celebration of the best that New York State has to offer. In addition to the steakhouse, there is an all-you-can-eat buffet featuring prime rib and seafood, Italian fine dining, 24 hour café and a snack bar. Seneca Allegany Resort & Casino offers 11 levels of pure luxury that puts Salamanca on the map as a premier resort destination. Pamper yourself in any of our 413 deluxe rooms. All of our rooms feature upscale amenities including a pillow-top bed, oversized shower, flat screen TV, internet access and more. And with over 21,500 square feet of meeting and conference space, Seneca Allegany Resort & Casino is a perfect location for banquets, tradeshows, conventions and meetings. At Seneca Allegany Resort & Casino, we provide an escape from the everyday. Enjoy a lavish respite from the unrelenting bustle of modern life… and a restful escape for the mind, body and soul. Rejuvenate in The Spa, our full-service spa and salon. Our full-service salon features attentive, accomplished professionals ready to pamper you. Relax with a Swedish massage, aromatherapy, full body wrap or facial. Enjoy a state-of-the-art workout facility, complete with cardiovascular equipment, circuit weights, free weights, an indoor pool, whirlpools and locker room. Seneca Allegany Resort & Casino is ideally located in the foothills of the Allegany Mountains. Experience all that the region has to offer including beautiful state parks, skiing, snowboarding and amazing hiking trails.